The year was 2000. It was August. Kansas City was experiencing an epic heatwave, 30+ days of 100-degree temperatures. The air was thick with humidity and, at my house, the sound of Barney’s voice and anticipation of the arrival of my second child. My first child was only 19 months old. She was really, REALLY, into Barney the Purple Dinosaur. Fast forward 6 years. My two children, now 7 and 5 years old, are not that “into” Barney – they are more obsessed with Sponge Bob and those twins living in a hotel with their singing Mom on Disney channel. Though he still lives, the once-cherished stuffed Barney now belongs to our boxer puppy, Tango, and lives in the backyard. Parents everywhere empathized with our total disdain for the Dinosaur with the Annoying Voice. One friend even told his little girl that she could not watch Barney on tv for several weeks because he had been in an unfortunate car accident and was “banged up pretty bad”!!!! On a cool Spring evening, I was scooping puppy poop in our yard for the umpteenth time. It had been very rainy out and Barney, now Tango’s best friend, had seen better days. I was certain it was his time to go. Thus, with little more ceremony than slamming his lifeless, once-beloved, purple body in the same plastic bag with my dog’s poop, I bid Barney a final, gleeful farewell. Then something very suspicious and spooky happened: this symbol of torture, maimed by a puppy and hugged to death by 2 toddlers, rose from the poop bag and uttered one final phrase: “Bye Bye!”. 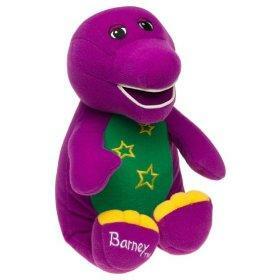 Barney got the last laugh. He is a very clever dinosaur. 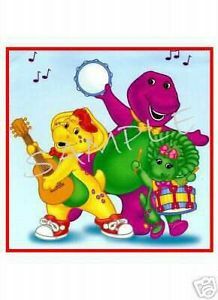 Isa came running from wherever she was playing when she heard Baby Bop’s band! LOL. I remember that story!!!! HA! I confess, it was a terribly creepy moment!!! !